Our flagship American IPA highlights the distinctively aromatic Australian Galaxy hop. The nose bursts with pine, citrus rind, melon and pineapple. Pronounced flavors of peach, clementine, and tropical fruits are accentuated with moderate bitterness and balanced by a light, biscuity malt character. Nice haze to it with citrus and hops on the nose. Taste follows the nose with a bit of earthiness and pine to it as well. Great beer overall. A - Hazy, golden-marmalade body. 3 fingers of white, fluffy head. Good retention and lacing. S - Pineapple, apricot, and other tropical fruit. Sweet citrus hoppiness. T - Candied or dried apricots and other tropical fruits. Slight lemon rind like bitterness. Well balanced. M - Awesome. Full bodied throughout. Very little stickiness. Probably the best M I've had in an IPA. O - Another terrific offering from Trillium. Opaque yellow pour with a magnificent white rocky head that stands at two fingers and stays put, textbook lacing in teku. Aroma is sweet tropical fruits, pineapple and pine needles come to mind, however this is a subtle nose that can hardly be considered aggressive in the hop department, especially with all the horn blowing about double dry hopping. Taste is reminiscent of sweet pineapple juice and pine, very pleasant but mild and slightly underwhelming. Mouthfeel is medium, and soft on the palate. No strong bitterness which may or may not be good depending on your taste. This is a fine IPA but I was expecting a bit more pop, especially for a $12 bottle.This is worth trying but I wouldn't go out of my way given the rarity and price point.I was glad to have tried it once. Pours a hazy golden in color w/ a massive multiple finger white head that laces the hell out of the glass. Aromas of big grapefruit, white wine, weed, and cat piss. The flavor opens w/ some grapefruit and malt sweetness, transitioning into mild pine, and closes w/ white wine and herbal hop bite. Medium bodied and lush as Trillium really nails this aspect with their brews. The finish on this is pretty juicy. Due to the great depth of flavor, absence of bitterness, and juicy finish this can be crushed in great volume. Overall, Wow! This is a go to IPA that you could drink everyday. If I were a Bruins fan, which I am NOT, I would want to drink this at every game. I am going to have to start sneaking this into Penguin games at the Consol Energy Center, making sure to pour it into a cup so my buddies don't realize it's from Boston. Growler was poured into a perfect pint glass. Appearance: A one finger head was poured that reduced to a thin layer. It is a hazy pale yellow color with slight vision of bubbles coming up through the glass. Nice lacing down the glass as the beer was drank. Smell: Tropical, grassy, pungent, floral, grassy, herbal, pilsner malts, and pale malts. Taste: Same as above. Mild tingly bitterness in the rear. Mouthfeel: Smooth, refreshing, medium carbonation, medium bodied, and mild tingly bitterness. Overall: Pretty solid IPA. You can never go wrong. Feel- Little light for an ipa of this strength. Creamy but light at same time. Overall- I liked this beer. Solid Trillium offering. However after having Double DH Congress a week prior, this is a big step down. The beer comes in a light golden orange with a fluffy white head. The aroma is very hop forward. Citrus, lemon, pineapple, tropical notes. The flavor follows with that citrus and tropical flavor and then onto a lingering piney bitterness. This is more substantial than Fort Port. There's a bit of a bready malt backbone, but dominated by fruit hoppy notes. A very clean and easy drinking IPA. Incredible beer. I've had many different type of beers and this beer is a great IPA.. Trillium has been on point with a lot of beers and they hit it with this one.. This beer is hoppy with an unbelievable citrus taste.. If I had to compare this beer to any beer it would be Abner by Hill Farmstead.. Cheers!!! A - Pours a hazy orange with a nice thick head. S - Aroma hits you in the face as soon as you pop the top. Nice mix of orange, pineapple and grapefruit. T - Flavor is very much like the aroma, lots of muted citrus, with just a hint of pine on the finish. M - Mouth feel is a little thicker than your usual IPA, but not as thick as a DIPA. Medium carbonation. Finally got out to the brewery, while the family was at the Children's Museum. Snuck in just before they closed, sorry guys, but I wasn't the last person either, by far! Filled a few hours ago. Pours a ridiculously murky hazy almost cartoony solid color, orangey carrot golden yellow, with a light fizzy head that barely covers the beer but at least sticks around for a while in the smallness of itself. But, I've had plenty of amazing IPAs that weren't the best lookers. Nose really is great, starting with pure mango juice, like mango puree, some guava and a bit papaya, even a hint of a musty passion fruit note, mild citrusy orange and tangerine, it has the smell of one of those awesome Dole Mango Orange + other tropical fruit style juices, like all the fresh squeezed fruit out the wazoo. A hint of a mild juicy malt base as well, a bit of pith and hint rind, quite nice. Taste brings lots of hops, as expected, fruits and fresh tropical fruit flavors mostly, a little grapefruit pith punches through at first, then quickly into the mango and papaya, little passion fruit resin and mild musty dank fresh hop resin, with a little orange juice and grapefruit juice, and even pineapple, it seem to have it all. This is pretty much a big glass of tropical and citrus fruit juice. The pithy little rind bitterness starts to really come through, with touch of bready slightly sweet malt, and decent creamy malt, nice creamy feel that really fills out to help deliver the hops everywhere. Finish is more pith and rind, quite bitter, with more tropical fruits and plenty of them lingering, but fairly dry finish, and the faintest hint of booze late. Hops bring just a touch of a minty note and apple skin like chracter super late on the bitterness. Mouth is med to fuller bod, fairly creamy and rich, it has the feel of actual pureed mango with lots of pulp (but no real chunks just thick), nice carb esp for a growler, and the faintest hint of booze late. Overall awesome! I can really see where they get their reputation now. This rivals Julius and many of the Hill IPAs. So much tropical fruit, juicy, nice malt base, and great mouth feel. It really was like drinking fresh pureed smoothie of tropical fruits. A: Super cloudy light orange pour. So cloudy it basically looks like a witbier. Enormous, frothy and tall light tan head. Head retention is top-notch and there is heavy spiderweb-like lacing everywhere. S: Oh wow, the aroma on this is absolutely incredible as soon as I start pouring it. It smells like sweet oranges and tangerines from a distance of about 10 feet. Upon closer inspection I get more tropical aspect, like pineapple and even mango. A touch of spicy pine maybe trying to break through. Wonderful aroma. If we still had ratings for each element of the brew, this would get a 5. T: Taste is right in line with the aroma. Very hoppy from the get go. Loaded with tropical fruit and bitter citrus. A hint of spicy pine combines with a nice big citrus peel bitter bomb in the finish. No real sign of malt that I can discern. Maybe a hint of crisp cracker malt. Long lingering grainy, bitter aftertaste. Can practically feel gritty hop sediment and hop oils floating around. M: Medium bodied, bitter, crisp and SUPER dry. O: Big, bold, west-coast style IPA. Super fresh, super crisp, super bitter. Great citrus and tropical fruit. Seriously delicious and one of the very best IPAs I've ever had. Dryness is astounding which does detract from the drinkability a bit, but at the same time it really lets the hoppiness shine. Another great IPA from Trillium. An unfiltered cloudy straw pour from a fresh growler with a bubbly thin head. A big piney hop nose. Lots of grapefruit, pineapple, and pine, with a touch of tropical fruit....really good stuff. A bit of the ganja as well.... Ya mon! Nice bitterness throughout, with plenty on the finish. The mouthfeel is crisp yet creamy; a pleasure to drink. 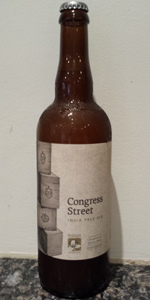 Like all of the street series IPAs from them, this is another well crafted beer by Trillium. A bit pricey at $23 for a growler, but worth the splurge. One I will remember as my Pats were winning #4 while I was having it. Just a short note on one of the most marvelous beers, it must have something to do with the white wheat that makes this very special. My good friend tolerates my IPA madness, but he screamed this is the first IPA he has ever liked a LOT. Could not give him enough of it, and I have to say the fragrance and overall balance of this beer between the malts and hoppy flower/fruit aromas makes it one of my very hard to get favorites! Pours a bright, opaque orange with a finger and a half of white foam for head. Head retention is good, as is the lacing left behind. Aroma is orange, papaya, mango, melon, and pineapple layered over biting pale and wheat malt notes. Lovely citrusy aroma luring in the lips for a sip. Flavor profile is smooth and round notes of orange, pineapple, melon, and mango. Tropical fruits are suspended over a base of wheat, pale, and biscuity malt notes. Hops absolutely dominate the flavor profile ratio here. Mouth feel is medium-thick, with a filling, grainy, velvety texture that drives this beers presence from modest to unabashed. Overall, it's pack-a-punch without remorse. It carries a heavy weight, and manages to deliver it unbroken. Big citrus notes, both domestic and tropical, layered over thin, but firm, malts. Served in a 12oz snifter from a 16oz can. purchased same day as bottled on!! mouthfeel was medium to light,creamy, nothing overpowering.... carbonation was nice. Canned 10/27/16; drank 11/5/16 @ the Yarchives. Huge, fluffy white head; thick, frothy lace. Mango, mint & fresh ganja notes in the nose. Prickly grapefruit & honey flavors up front; mild mint notes on the finish. Interesting & refreshing, but not revelatory. Bottled on May 26, 2015; 6 days before drinking.